Samford University's Ida V. Moffett School of Nursing has received $25,527 to provide support for students in the nurse anesthesia program. This is the 12th year for Samford to receive a Nurse Anesthesia Traineeship (NAT) grant from the U.S. Department of Health and Human Services, Health Resources and Services Administration (HRSA). Nurse anesthesia traineeships can be used to pay the costs of tuition, books, fees and reasonable living expenses of trainees. According to Terri M. Cahoon, chair of the Department of Nurse Anesthesia and grant administrator, these funds are particularly important because nurse anesthesia students are unable to work during the program, and many of the students have families and are living below the poverty line. “Because our students are unable to work during our full-time program, there is often a hardship regarding meeting expenses for things like books, tuition and fees,” said Cahoon. “Students typically rely on family support and government and private loans to finance their education, and the traineeships allow us to help alleviate some of the financial burden,” Cahoon added. To date, Samford has received more than $213,527 through the HRSA NAT Program. 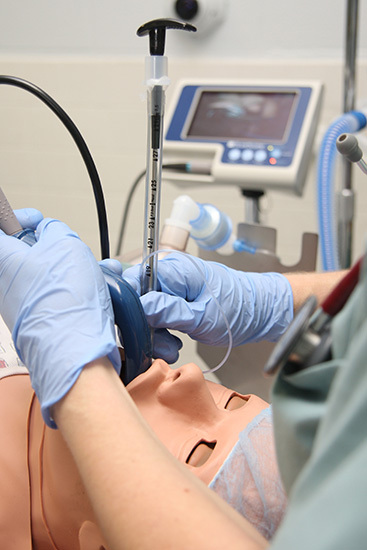 The NAT Program, gives special consideration to nurse anesthesia programs who demonstrate a “high rate” of graduates practicing in Health Professional Shortage Areas (HPSAs) after graduation, contingent to receiving some type of student assistance. According to Cahoon, the Samford program has a long history of graduates who seek opportunities in rural and underserved areas of the southeast. Of the class of May 2014, 64 percent are currently employed in HPSA or medically underserved communities and approximately 75 percent of the current nurse anesthesia students who receive traineeship funds are from disadvantaged backgrounds or rural/underserved areas within Alabama or neighboring states. In order to address Alabama’s current and future CRNA staffing demands, the Samford Nurse Anesthesia Program concentrates on recruiting applicants from and placing graduates in rural locations. Ten of 27 clinical sites are located in rural areas with 22 in medically underserved or health-care professional shortage areas. For the 23 nurse anesthesia students who graduated in 2015, 77 percent of their clinical hours were obtained in rural, medically underserved or health-care professional shortage sites. “By providing students with experiences in rural locations and a familiarity and initial comfort level with rural anesthesia practices, our confident expectation is that they will seek employment in rural and medically underserved locations after graduation,” added Cahoon.